When Bryan Flanagan sat in front of his laptop last month to compose a Facebook status that would officially announce his bisexual orientation to the social media world, how the news would be received by the brothers in his fraternity did not even cross his mind. While on paper Greek life is open to all, some members have had alternative experiences. Â “Sasha,” who asked that her sorority at URI and her position on its executive board be kept anonymous because she is not ‘out’ to her parents, has been dating a girl who is not Greek for almost a year- her first homosexual relationship. Â About half the members of her sorority know about her girlfriend, and though they have all been accepting, she is hesitant to broadcast the fact she is dating a girl and questioning whether she identifies as bisexual, to the Greek community. Sasha said that though other girls in both her house and other sororities are openly gay and readily accepted for it (and she knows the same acceptance would be extended to her), she worries that Greek life’s stereotyping of houses could detriment her sorority’s social standing if she, as an executive member, was out. Â “I would care if every time [my sorority] was mentioned if people were like ‘Oh, this person’s a lesbian in [that sorority],’” she said. Regardless of her personal choices to not be openly out, Sasha said that people who are minorities should not be afraid of joining Greek life. Â “The stereotype is that we’re [Greek life] against all minorities, but it’s not true,” she said. Â “I don’t feel like that in my house.” The only discomfort she has seen from members of Greek life is in inter-house hookups, something Flanagan agreed he too would not do. “Some people think it’s weird that you’re hooking up with someone you’re supposed to be so close to you would call them your brother or sister,” Sasha said, citing the example of a frat on campus that considered expelling a member who almost “hooked up” with a pledge. Since a video of brothers in the University of Oklahoma’s chapter of Sigma Alpha Epsilon (SAE) singing a racially charged chant surfaced on social media, resulting in the house being kicked off campus and the expulsion of implicated members, the racial diversity of Greek life has also been under scrutiny by the media. “A brother doesn’t have sexual preference either,” he added. “If he’s loyal to us and supports us in our mission, he’s welcome in our fraternity. Â Granfield estimates that of the 79 members in his fraternity, 14 are African American, nine are Hispanic, six are Asian and one is of Middle Eastern decent. Regardless of Granfield’s testimony, the heterosexual white stereotype Greek life often holds is still deterrent to some minority students who do not see their personal values, or even physical appearances, represented. Kevin Pajaro, a senior communications major of Dominican and Columbian decent and vice president of the Greek-lettered multicultural organization Lambda Upsilon Lambda, did not see himself fitting into a traditional fraternity, despite the respect he has for many members. 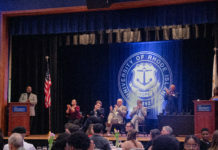 Pajaro is the student liaison for the currently-dormant Multicultural Greek Council which oversees the eight Greek-lettered multicultural organizations recognized at URI. Â Though his organization only has two active members, he feels like he is a part of a movement rather than just an organization.